Our list of new books is updated at Research > New Books. 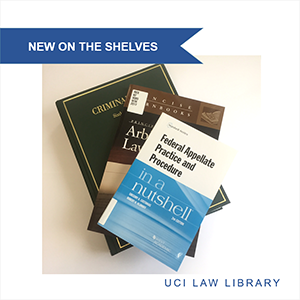 In July, the Law Library received titles on Abortion, International Law, Intellectual Property, and Employment Discrimination, among other topics. Wills and Estates, Appellate procedure, Criminal law, and Estate Tax. “Legal Study aids” are meant to help students with coursework, or provide a very brief introduction to a legal topic. Series titles include Nutshells, Understanding, and Concise Hornbooks. More information about study aids — including access to online versions from West Academic and LexisNexis Digital Library — is online at Research > Study Aids. Our collection supports the scholarly and clinical work of faculty and students. Let us know if you have a suggestion for a new book: apps.law.uci.edu/libraryfeedback.